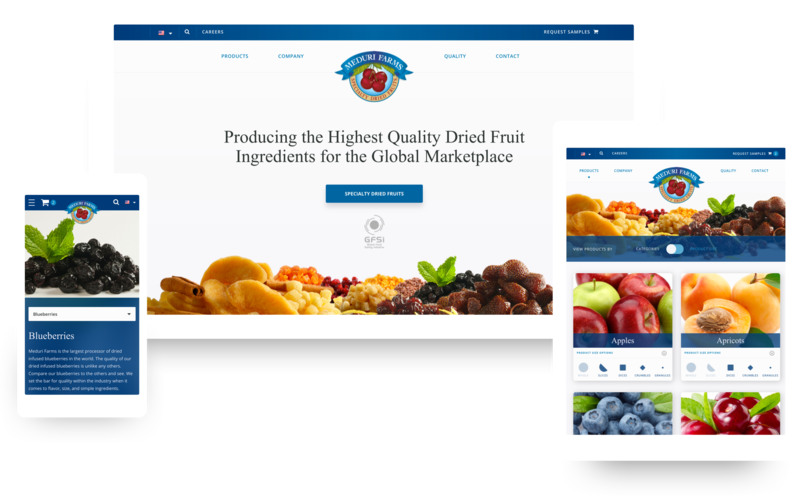 An industry pioneer and leading global supplier of specialty dried fruit, Meduri Farms hired Harlo Interactive to design and develop a new website to support sales, attract talent, and automate the product sampling and lead generation process. 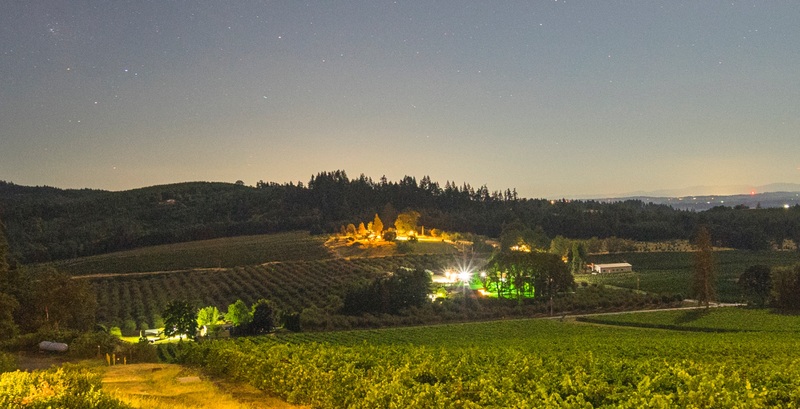 Starting with interviews and research, Harlo was able to bring together both form and function to create an experience that enables food suppliers and scientists to quickly find the right ingredients for their next product innovation. We approached design with open white space and vibrant fruit photography, allowing Harlo to showcase Meduri Farms variety of product styles and options. It also allowed for product imagery and technical information to be consumed in an easy browsing experience tailored to the needs of the users. 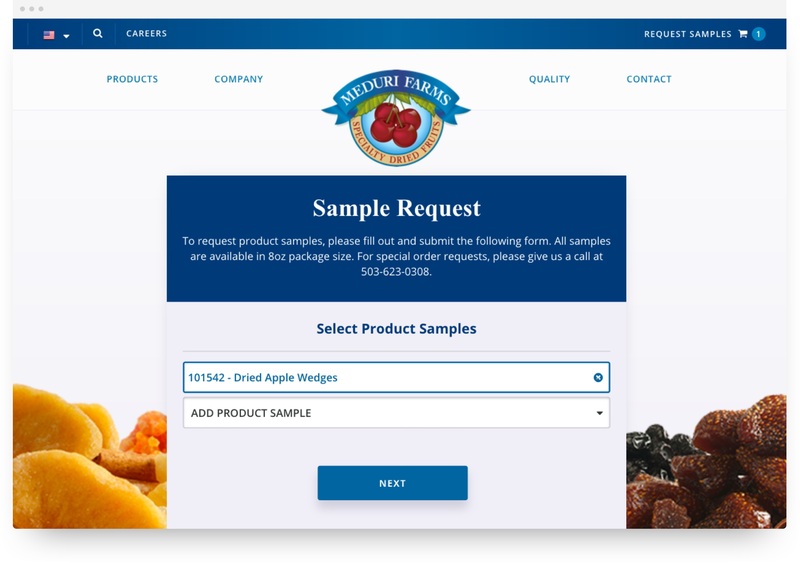 The website also includes a personal shopping cart feature, that allows users to save samples to a cart, helping to streamline the ordering process. Shopping for ingredients has never been so easy, and fun! 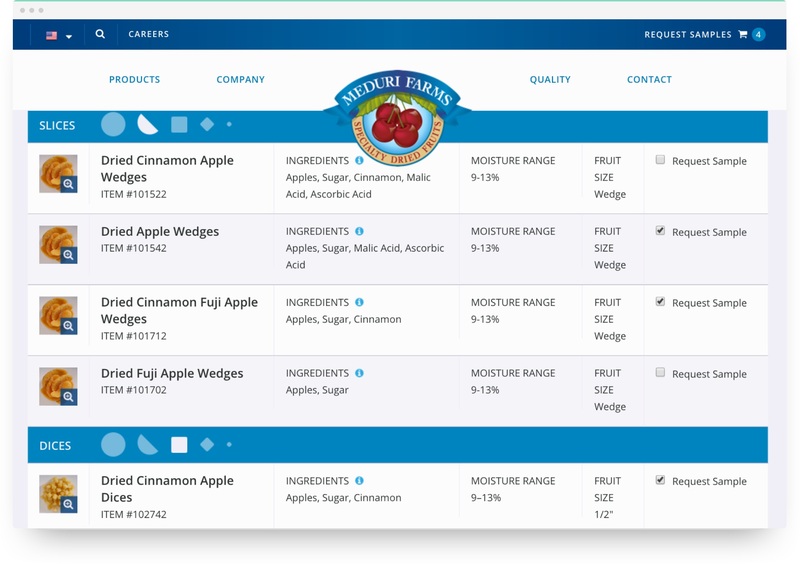 The website's results are as sweet as the Meduri Farms products themselves. Using both a card design system and alpha numeric list, we were able to optimize product wayfinding and ultimately impact lead generation with a 250% increase of leads through the online shopping cart and form. 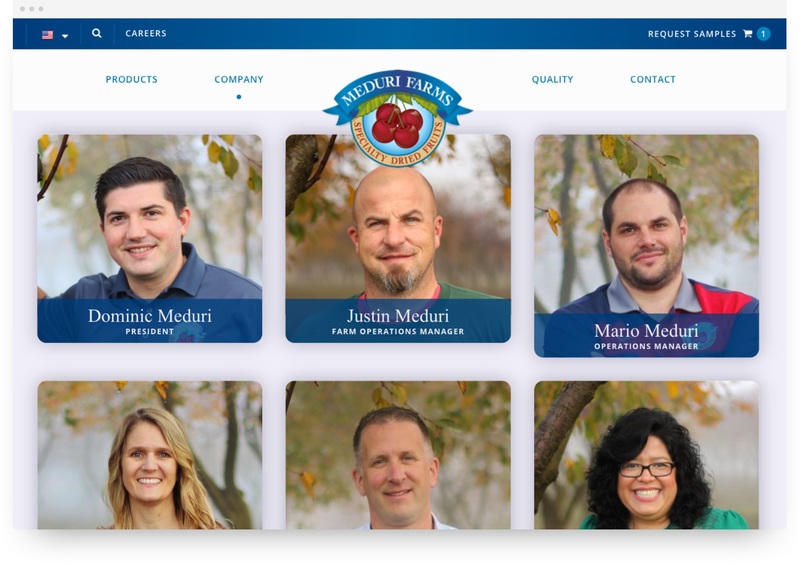 Besides increased leads, the website's new visual design helped Meduri Farms establish their brand and tell their story, generating more traffic to their careers page, and attracting new talent as their company continues to grow their market share. 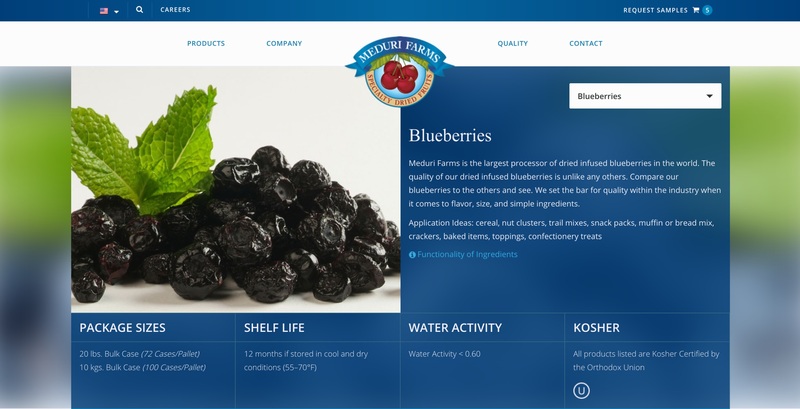 "We were very confident in partnering with Harlo’s team of creative designers to build a new website for Meduri Farms. Harlo was helpful in guiding us through the experience with their digital strategy approach. They also kept us on track to maximizing our total investment in the project. 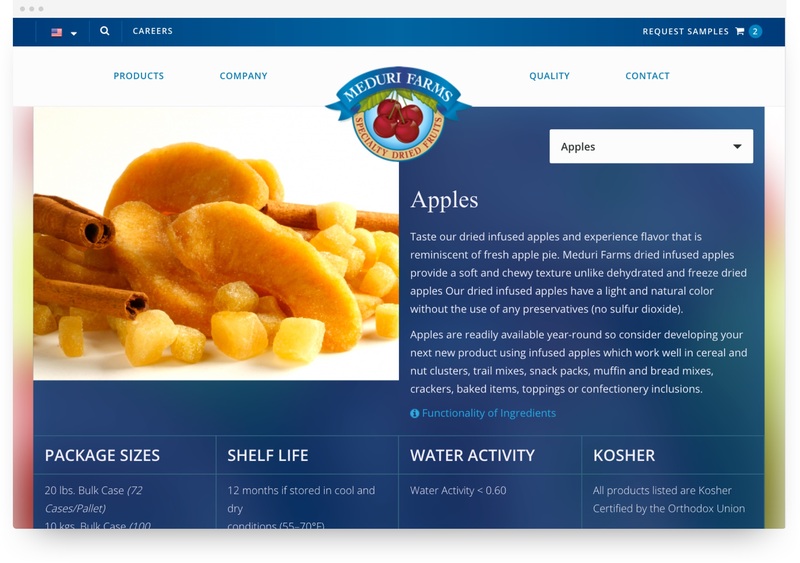 Meduri Farms’ dried fruits were reintroduced to the global marketplace with an optimal digital presence, which is reflective of our company’s mission and values. We are pleased with the final project and impressed with the performance and return we have seen thus far."